Harry, Hermione & Ron by Nan Lawson. I watched the last Harry Potter movie over the weekend. I don't know whether to call myself a fan but I did want to do the whole first day-first show thing. Unfortunately, it was only playing in multiplexes on the second day. But, I managed to catch the show in 3D. Wohoo! And I got myself there on a rainy day. So, that probably does make me a fan. Now, it may be a bit pointless do watch it in 3D since it's a regular movie so only things like explosions, dragons and subtitles really pop. Was it worth it? Ofcourse it was. I watched the movie with a friend of mine. She's watched the last few movies of the series with me. And it's always the same routine. We watch the movie, feel great and go and get a drink later because we're so happy and feel the need to celebrate. 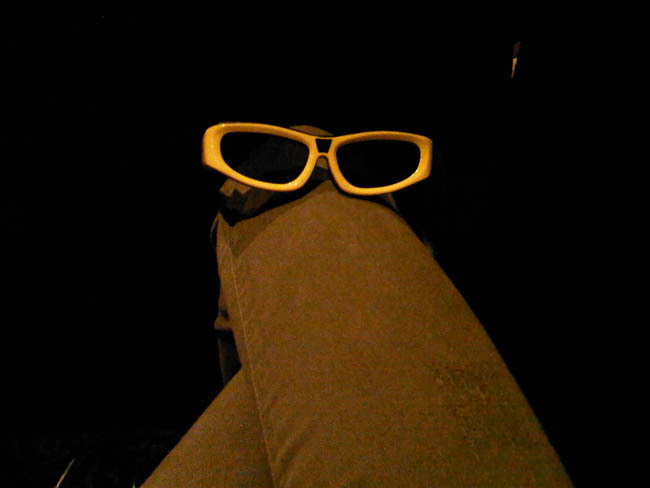 So, on Saturday I went to watch Harry Potter and the blah blah blah in 3D. I went armed with a sweater and warm socks (with hearts all over them). For some reason my friends find it embarassing to be seen with me when I look like this. Ok, so maybe sometimes I look like I've popped right out of Alice in Wonderland but I have my reasons. I am only making sure I don't go home sneezing. As much as I love going to the theatre, I hate how it feels like I've bought a ticket to watch a movie in a refrigerator with 300 other people. Anyway, we got to the theatre a little late. My taxi was moving slowly, I was running in the rain, then stopping to take a breath because I'm not as young as I look, then walking instead of running so I don't slip outside, got my bag checked a bunch of times like I was a criminal and reached about 5 minutes late. I was pretty mad at myself for reaching late since before rushing and leaving home I had spent an hour moving very slowly - washing and drying my hair and eating the Shawerma that my mother had made with so much love. But then we walked into the theatre and got super cool 3D glasses. The childish excitement made me forgive myself for being late. I got Yellow glasses and my friend got Blue. And we both got a wet tissue packet with it so we could disinfect it before using it. How cool is that? And thoughtful. But, does it really work? I don't know. Wouldn't germs spread more on a damp item? Ok, I need help. Steering away from the tangent, and cruising back to the point, I absolutely loved the movie. And I didn't even need popcorn to complete the perfect cinematic experience. A friend who had read the books told me she was slightly disappointed with the last movie. Obviously a movie can't cover every detail written over 100s of pages. I'm glad that I hadn't read any of the books. The movie had quite a few surprises in it for me. Harry, Hermione and Ron's accents are so fun. I've always loved the names of all the characters. My favourites being Bellatrix Lestrange and Luna Lovegood. Love the spells. Luckily I can't actually use them or I'd be the Queen of Control Freaks if I could use Imperio every now and then. Snape and his powerful voice that commands your attention. Voldemort's laugh after he thinks he's killed Harry is pure evil. Love it. The finale being all that I expected it to be. Good winning over evil: the perfect ending. I believe in happy endings as clichéd and unreal as they may seem. It gives us hope. So why not? "Ofcourse it's all in your head Harry, but why should that mean it's not real?" Which basically means that what's real is what we label as real. Do we really dream at night and live our regular lives during the day or is it the other way? Do we believe what we do because we have been told to? Thank you for making my imagination pop and explode beyond a space that even I didn't know existed.